If you’re already registered as a Free user with Live Net Video, you’ll need to login when you go to the site. To get to the Login Screen click on the Login Button at the top of the screen on the Live Net Video site. This opens the Login Screen. If you want the Login screen to recognize you in the future, click the Remember Me Box. When finished, click the Login Button. 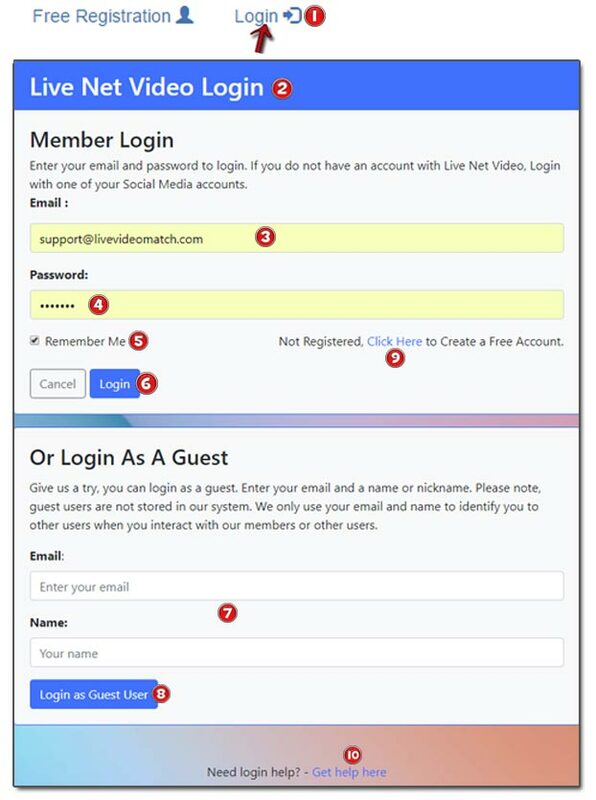 If you’re not registered with Live Net Video and want to use the Live Video Connector, enter your email and name. When you’re finished entering the information for a guest login, click the Login as Guest User Button. If you haven’t registered for your Free Account, Click Here to create your account. If you need help Logging in, click the Get Help Here link.